When pop stars like Kelly Clarkson or Justin Bieber talk about standing their ground, these musicians opt for overt statements that rely on cliche to convey their themes, like “if it won’t kill you, then it’ll make you stronger,” or similar clear messages. 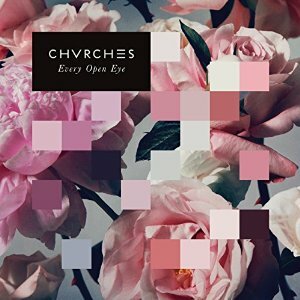 Glasgow-based Chvrches‘ sophomore release Every Open Eye avoids tried and true words while still maintaining a blissful simplicity to the band’s performance and thematic relevance. This synthpop album shines in its themes and lyricism, even with the sometimes formulaic approaches to song structure. Thematically, Every Open Eye focuses on having unrelenting confidence (“Playing Dead,” “Down Side of Me”), while still examining the importance of regret and seeing another’s point of view (“Empty Threat”). Whether it be through minimalistic synths (“Clearest Blue”) or catchy beats (“Leave A Trace,” “Never Ending Circles”), Chvrches develop the skill of producing songs that don’t feel similar, a problem that could be felt in their debut album The Bones of What You Believe. Martin Doherty’s vocals don’t feel arbitrary on this new album because they add the other side of the story. Every Open Eye doesn’t take risks, but those that loved the band’s previously release will feel right at… chvrch.